Breaking Bad’s most shocking and explosive season yet arrives on DVD October 1st as Sony Pictures Home Entertainment releases AMC’s Breaking Bad: The Complete Fourth Season. To celebrate this momentous occasion, we’ve got THREE DVD copies of the to give-away absolutely free. This is an exclusive competition for our Facebook and Twitter fans, so if you haven’t already, ‘Like’ us at facebook.com/CineVueUK or follow us @CineVue before answering the question below. In Breaking Bad: Season 4, chemistry teacher Walter White’s (Bryan Cranston) dark transformation to full-blown criminal reaches lethal new heights as his battle of wits with vicious drug kingpin Gus Fring (Giancarlo Esposito, TV’s Once Upon a Time) continues. 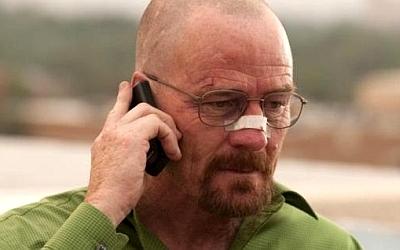 Cranston, winner of three Best Actor Emmys for his role as Walt, stars alongside Aaron Paul, Emmy winner (Best Supporting Actor) for his portrayal of Walt’s colleague, Jesse, in this critically acclaimed dramatic series. What was the name of Bryan Cranston’s lovable dad character in Malcolm in the Middle? Breaking Bad: The Complete Fourth Season is available to own on DVD from Monday 1 October, courtesy of Sony Pictures Home Entertainment. The competition closes at 6pm on Thursday 4 October, 2012.